How Far is KGEYES RA Puram? Located at the heart of the city, it is comparable to Boat Club and Poes Gardens in terms of poshness. Schools, markets, temples, parks, office complexes and corporate hospitals abound all 4 directions. With the sea shore just 2 km away from here, there is abundant wind movement inside the flats. Nevertheless, connectivity to any part of Chennai is the awesome feature of this project. Each floor consists of just 1 flat in a huge size of 3794 sq.ft. with a private terrace of around 300 sq.ft. RCC framed structure with non-load bearing brick and cement mortar walls. Generally outer walls will be 9" and inner partition walls will be 4.5" thick. Ceiling height will be 9'6" approximately except in the toilet wall where it will be 8'6" Water proofing for wet areas, terraces will be provided as per standard. Foyer, Formal Living, Family Living & Dining – Italian Marble Rs.400/- per sq.ft (including laying charges) All Bed rooms, Kitchen except Bath room, Service & Balcony with 3x3 VITRIFIED TILES Rs.160/- Per Sq.ft. (Johnson/RAK/Nitco) (including laying charges) Kitchen service & Balcony's with 1x1 plain colour ceramic tiles. (Kajaria / Somany ) Rs.40/- Per Sq.ft. Flooring in all toilet areas will be of 1x1 Non-Skid Tiles. (Kajaria / Somany) Rs.60/- Per Sq.ft. The main door frames and door panels will be of teakwood with self-design and finished with lacquer varnish. Main door will be provided with Godrej Ultra lock, one aldrop, safety chain, peep hole, antique brass keels and tower bolt. All the other doorframes will be with good quality teak wood. Bed Room doors will be 2 Panel B.S.T flush door, varnished on both side with one lock and tower bolt. (Godrej/Europa). Toilet door will be OST flush door's one side varnished and other side Polyurethane coating with Enamel painting finish with aldrops and baby lock. (Godrej/Europa). All the door fittings will be of Antique Brass. Steel grills (painted in Black colour) in all windows and ventilators. Well seasoned good quality wooden window frames with open type shutters with glass/UPVC. Ventilators will be of wood frame fitted with glass louvers. Power point for Split AC with A/C ledges to accommodate condenser units will be provided in all 3 Bed rooms, Living Room & Family Living & Dining. All windows and Ventilators will be enamel painting finish. Black granite Slab including shamphering for kitchen table top Single bowl stainless steel sink with Drain board (Make-Nirali or Parry ware) 2 feet dado above the kitchen counter with Designed ceramic tiles. 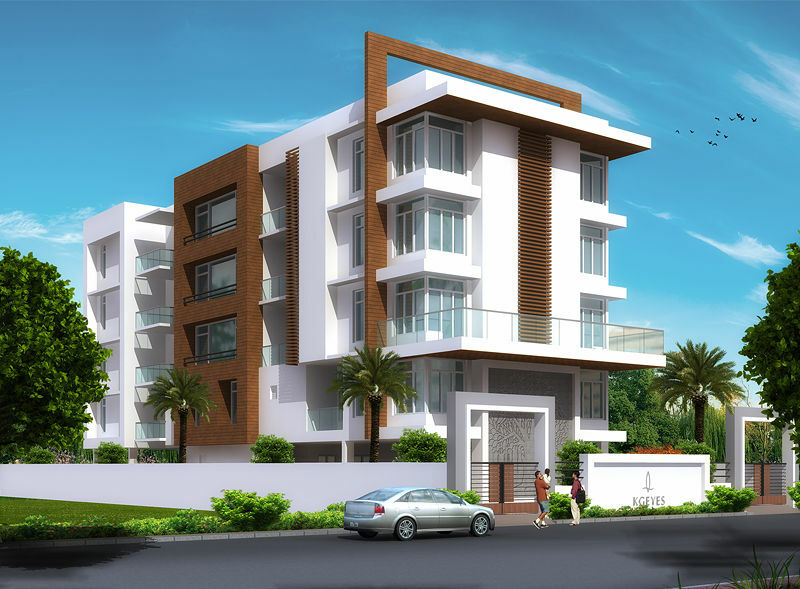 (Kajaria/Somany)-Rs.60/-per sq.ft. Kitchen will have two taps, one for bore well and other for CMWSSB/Metro water. Adequate bore well and metro water sump. Two over head Tank one for metrowater and other for bore well water. Concealed Three Phase Electricity supply with Finolex Wiring/L&T, E.L.C.B. adequate light, fan and Plug Points. Switches will be of M.K/L&T /legrand. Separate meter for lighting in common areas, lift and the pumps. Each Allottee shall have an independent electrical meter connection. Name Board: Stainless Steel Name Board will be provided at lobby. Letter Box: Individual letter box will be provided for each flat owner at the entrance. Flat No: Individual Flat Number will be provided in the entrance of each flat. TV Line (DTH): Concealed PVC pipes for TV cable will be provided with five entry points one in the living room, family living and the other three in the master bedrooms. Telephone Line: A common board will be provided near the entrance to the building for incoming telephone line, with provision for concealed wiring from this board to five points in each flat, one in the living, formal living and the other three in the master bedrooms. Landscaping: Will be provided in chosen areas. Common Area: outside the building will be provided with paving block. Lobby & Staircase: Granite finish. Common Area Lighting: Light fixtures will be fit it in common areas. Car Parking: Will be numbered and lines will be drawn. Servants Toilet : Will be provided Terrace: Food counters and Wash Basin. Pest Control: Will be done. Compound Wall: Will be provided on all sides, retaining existing walls if any. Roadside wall will be built to design as specified by the Architect with gates. Pressure Pump: Grundfos pump to maintain line pressure in the water lines. Rain water harvesting will be done.